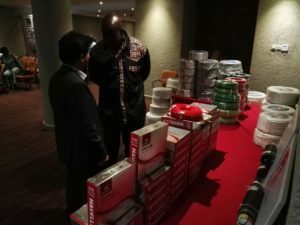 A leading dealer in electrical, electronics and home appliances, Insons on Friday (September 15) unveiled different kinds of high quality home appliances that would meet the felt needs of Sierra Leoneans. The products which were unveiled at the Radisson Blu Mammy Yoko Hotel in Freetown will help address the many problems encountered by people when using electrical products, especially in their homes. The products were manufactured by Havells, a leading electrical equipment company in India. The company has products ranging from home and kitchen appliances, lighting for domestic, commercial and industrial applications, LED lighting, fans, modular switches and wiring accessories, water heaters, industrial and domestic circuit protection switchgear, industrial and domestic cables and wires, induction motors, and capacitors among others. In his short statement during the launching, head of Insons, Dilip Narwani stated that his company has been in the business of providing quality and affordable home appliances and electrical for the past 25years. Because of their determination to cater for everyone, Mr. Narwani said they decided to partner with Havells, a leading manufacturing company based in India to bring quality products that would solve the many issues associated with the use of electrical and electronics, especially appliances. He encouraged their valued customers to continue patronizing with them by buy their products regularly, assuring them of durability and sustainability. In his short presentation, Senior Manager at Havells, Dinesh Rao said the company was formed in 1958 and that since then, they has been manufacturing different kinds of domestic appliances, including wires, switches, fans, cables and capacitors, among others. “Our products are of high quality to meet the needs of our customers and agents. They are durable and affordable. We also own some prestigious brands. We have our operations in 52 countries, including Africa, Europe and the Middle East,” he said and added that they have 22 manufacturing plants in India and other countries. He continued further that the company can also boast of some 20,000 dealers and distributors globally, of which 5,000 are based in India. Also speaking at the launching was the president of the Sierra Leone electrical contractors association, Leslie Ned Yaskey who welcome the launch of the new products. He stated that Havells is producing cables that are fire resistant, adding that if it is properly popularize in the market, it would help in saving a lot of fire accident in the country. When ask about affordability and whether the products will be accepted by customers, Mr. Yaskey opined that the problem with the Sierra Leonean market is that people with money go for cheaper products. He added that they intend embarking on a massive sensitization of people about the quality and durability of these products and advise them to go for the best. Hi there, does Insons have an online store? I’d like to buy some online vouchers for some friends in Freetown.